Galway East Tourism - Lady Gregory Hotel in East Galway, West of Ireland.Galway East Tourism - Lady Gregory Hotel in East Galway, West of Ireland. A Warm Friendly Welcome awaits... 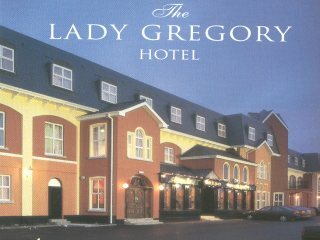 The Lady Gregory Hotel is a one of the finest hotels in Galway. As you enter the architectural splendor of this Galway hotel, you have immediately found a haven of tranquillity. The Lady Gregory Hotel is ideally located, with many local and historical attractions for you to discover and surrounded by the magnificent moonscape of the Burren. Whilst visiting Galway, indulge yourself at our restaurant, with a variety of Local Flavours and International Dishes freshly prepared by our award winning Chefs, complimented with our extensive selection of fine wines. The Lady Gregory Hotel in Galway is also home to a fully equipped conference facility, superbly appointed wedding reception venue and the new and luxurious Swan Leisure Club.